With apologies to Nathan Englander, what should we look at when we look at Anne Frank? Faith & Form, the new exhibit at The Anne Frank Center USA provides some answers. Aligned with the Center’s mission of using the diary and spirit of Anne Frank as tools to educate about the dangers of racism, anti-Semitism and discrimination, the exhibit features multi-media work by 21 artists, all members of the Jewish Art Salon, addressing those issues in a range of styles and expression. 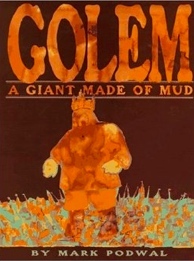 Interestingly, several of the artists took the Golem, a figurative symbol of resistance to anti-Semitism, as a starting point. Mark Podwal, who has long been intimately involved with the Alte-Neue Shul (Old-New Synagogue) in Prague, the legendary birth/resting place of the Golem, submitted a sketch from his illustrated book on that subject. Podwal’s Golem is a monolithic, mindless creature who destroys as well as protects, crushing cities underfoot while saving his chosen people from harm. Ash Fitzgerald takes a different and more personal tack in his approach. 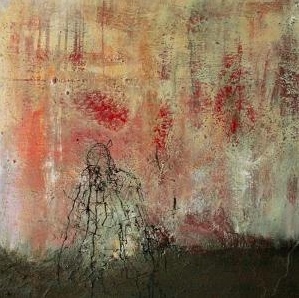 In “Passing Through (A Golem’s Journey),” Fitzgerald departs from the story and uses the image and the myth to explore his own awakening from a near-death experience.